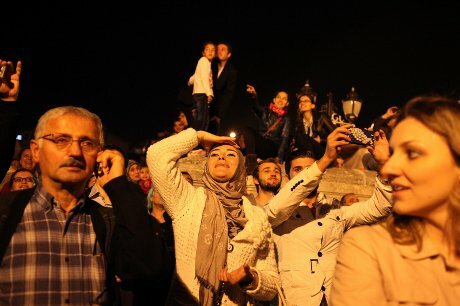 People watch fireworks on 90th Republic Day of Turkey, October 29, 2013. Demotix/Nurcan Volkan. All rights reserved. During the course of the summer protests, many analysts, scholars, and public intellectuals alleged that the Gezi Park protests had changed Turkish politics for good and for the better. They were most certainly right about the former conclusion but most likely wrong about the latter, for the Gezi episode was merely the symptom of a problem, that is, Turkish democracy’s gradual slide into more and more authoritarian territory. Put bluntly, many spectators mistook the symptom of the disease for recovery, or even a cure. 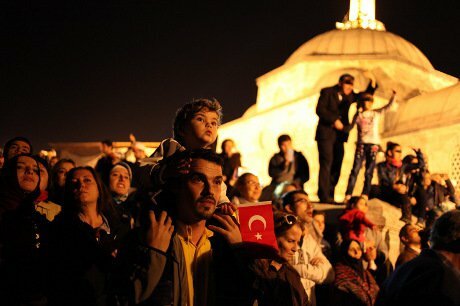 The past five months have clearly shown that Gezi was anything but a cure to the problems of Turkish democracy, whose health is deteriorating, especially with the AKP amplifying, not alleviating, the concerns of the very segments of the society whose reactions to AKP’s encroachments triggered the protests in the first place. Consciously or inadvertently, AKP is further entangling itself in what can be called a “majoritarian trap”, by implicitly defining its own support base - the so-called its own “fifty-per cent” (which stands for the percentage of votes AKP secured in 2011 general elections) - as its only audience. Recognizing this trend, many might blame the AKP for further polarizing the political landscape. This would only be partially true, for we cannot talk about bipolarity (or multipolarity) in present-day Turkish politics. What we have is a case of “unipolarity,” with AKP as the single most powerful actor whose political might cannot be checked or balanced by its critics or opponents, who in turn remain essentially divided. Consequently, further polarization – or unipolarization - only serves the AKP, if in the short run, since it ossifies AKP’s relative political might vis-à-vis its political competitors. Of course, there is no such thing as a free lunch and the AKP is running two risks. First, the kind of polarization that the AKP is fuelling can eventually trigger political instability in Turkey’s ever-changing and slippery political arena. Second, such polarization will gradually erode Turkey’s relations with the EU, for the simple reason that the AKP cannot have its cake and eat it too. Put simply, AKP cannot keep practicing a majoritarian understanding of democracy through the insistent “unipolarization” of the country and keep the international audiences assured that it strives for a democratic Turkey that belongs in the west. A political winter looms on the horizon. Spectators who are concerned with the health of Turkish democracy, both domestic and international, should start paying closer attention to the problem, not merely the symptoms. Celebrations of the 90th Republic Day outside Şemsi Ahmet Paşa Mosque. Demoitx/Nurcan Volkan. All rights reserved. When countrywide protests shook Turkey during the hazy days of June, critics of Prime Minister Erdogan and his AKP were quite optimistic. Many agreed that the so-called “wall of fear” was finally breached, if not destroyed for good. Long assumed to be decidedly apolitical, the “youth’, others claimed, had finally risen up and raised their voices. The encroaching neoliberal policies that entailed the “capitalization” of the urban landscape without any discernible concern for the environment or societal needs had finally reached their limits according to other commentators. For many of its supporters, the Gezi Park protests were also a wake-up call to Erdogan, whose patronizing rhetoric and attitude appeared to put it mildly, threatening. For the critics of Erdogan and the AKP, Gezi meant hope. However, the five months that have passed since June have done away with the initial euphoria, not to mention the optimism of the early days. While Gezi changed the ways in which Turkish citizens think about politics, it has done more to expose the troubles of the Turkish democracy than to alleviate them. Make no mistake. It is now commonplace among the proponents of the protests to portray a rather romantic vision of the impact of the “days of resistance” by delving into the discourse of “this is just the beginning.” Many supporters of the “resistance” also seem to be convinced that whatever Erdogan is doing to prevent similar protests from happening again (such as increasing control over the universities as well as granting police substantial powers so that they can “preventively” arrest prospective protestors before they ever have a chance to, well, protest), he is doing them because Gezi has been so successful, that is, successful at scaring the AKP. These discourses help the protestors keep the “Gezi spirit” alive and their otherwise fragile spirits up, but they may be more misleading than meets the eye. Gezi most certainly signalled the beginning of a new era in Turkish politics, but probably not necessarily a more democratic one. What is really “beginning” may not be what the protestors think is beginning. Also, while it is safe to assume that the AKP’s recent attempts at further curbing mass protests and deterring criticism follow from the shock and anxiety that Gezi instigated among the party’s ruling cadres, it is more difficult to argue that the outcome is a “success.” AKP is not retreating from its former position, it is just taking both defensive and preventive measures so that it can stop protests that may erupt in the future dead in their tracks. What is more worrying is that AKP is not stepping on the brakes, but on the gas, and this time with a new twist. The patronizing, disparaging, and all-imposing political discourse that triggered the protests of the summer in the first place had little more to offer by way of novelty. This remains more or less a discourse of “the but”; Erdogan or his lieutenants begin their statements with an opening like “we respect everyone’s rights and opinions,” only to follow with the qualifier “but,” which then reveals another round of salvos that most certainly place the social segments that do not share AKP’s vision or worldview increasingly under threat. The recent controversy over the cleavage of a TV host is most revealing. Suggesting that everyone had a right to dress as they liked, AKP Vice President and spokesman Huseyin Celik added: “… but, this is unacceptable.” The host was instantly fired, displaying the precision and scope of AKP's "soft power." As awkward as this incident may appear to the western eye (the Vice President of the governing party tackling the fashion choices of a relatively little-known TV personality), it is no longer surprising in the Turkish context. The twist in post-Gezi Turkey is the amplified and explicit discourses of polarization that divide the country between those who are with Erdogan, and those who aren’t. In fact, what we are observing is not pure polarization, invoking metaphorically the two poles of the globe. What AKP is doing is unipolarizing the political landscape, setting the stage for a system where it can embolden its rule by drawing upon the power of the majority in the face of a divided and much weaker archipelago of political opponents. As I wrote here a while ago, Erdogan missed a golden opportunity during the summer; he could have chosen to embrace the protestors, try to “understand” them, alleviate their concerns, and step on the “brakes” with respect to the AKP’s ever-increasing attempts at imposing its “ideals” on the very segments of the society that do not share them. Erdogan did just the opposite and chose to marginalize and criminalize the protests as well as the protestors. AKP and its supporters in the media blamed almost every outlet within or beyond imagination for being the “real” force behind the protests, but never AKP’s own discourses and policies. Furthermore, the AKP has been pushing even harder as far as imposing its ideals on society is concerned. Among many examples, the latest and most controversial move was made by Erdogan himself, who, out of the blue, instigated a public debate about whether “girls and boys,” that is, male and female university students, are supposed to live under the same roof. According to Erdogan, they should not. If he were to merely suggest that he was voicing his personal opinion, the statement would be somewhat awkward but nothing to be obsessed about. However, when the prime minister introduces phrases such as the “differences between legitimate and illegitimate lives” into the mix while at the same time strongly underlining that the government will do “whatever is necessary,” the rhetoric can no longer be classified as awkward, but becomes particularly ominous for those who do not share the same worldview. To be sure, individual issues and controversies are less important than the underlying problem that is driving them. The issues change almost on a weekly basis, but the problem only becomes worse. The “controversy of the week (or the month)” was the ban on the sale of alcohol during certain hours some months ago, followed by abortion, the destruction of a historic movie theatre in Istanbul, the TV host’s cleavage, or, most recently, the question of whether 18-25 year old boys and girls can become roommates. The controversy over Gezi Park was the only one that led to mass protests, but becoming obsessed with that particular controversy detracts from the real problem: the majoritarian trap that pushes AKP further and further away from a pluralist understanding of democracy. The AKP found itself in this trap directly after its electoral victory in 2011, where it first secured the so-called “fifty per cent” of the votes. The logic of the trap is straightforward: once it secures the majority of votes (more precisely, the “minimum winning coalition” in political science jargon), a political party may try and sustain its rule by “speaking” solely to its own base and can easily afford to ignore or even alienate those left outside the circle. In extreme cases, it may even have an incentive to fuel and sustain tensions between its own base and the rest, since such manoeuvres will further embolden the role of the party as the sole spokesman of the so-called winning coalition. Erdogan’s initial reaction to the electoral victory was reassuring, suggesting that he did recognize the pitfalls of securing one in every two votes and almost two-thirds of the parliamentary seats in a country where democracy was still young and rough on the edges. However, the AKP eventually could not resist the temptation and increasingly drew upon the discourse of the fifty-per cent in order to project an all-knowing and ever-patronizing image into the lives of all Turkish citizens. While this attitude may be acceptable or even desirable for many members of the AKP’s “own” fifty-per cent, it is worrying and threatening for some segments of the “other” fifty per cent. Gezi Park protests, in this context, were a spontaneous reaction to the AKP’s slide into the grey area between majoritarian democracy and authoritarianism. In so many ways, Gezi Park showed the AKP the limits of its power by reminding the government that while it is the most powerful political actor in the country, it is not all powerful, not yet. But it also made it clear that when the chips are down, AKP is still far more powerful than its individual rivals, who remain divided. Having faced its limitations and aware of its potential strengths, it seems that the AKP under Erdogan, despite some residual disagreements from within the party, is further polarizing, or more precisely, unipolarizing the country. This tendency can allow AKP to claim new electoral victories down the road, yet it will also push Turkey away from a pluralist understanding of democracy. So, how will these arguments impact on Turkey-EU relations? In simple terms, we may soon witness the last tango between Turkey and the EU over the issue of Turkey’s accession. The writing is on the wall. If the AKP remains inside the majoritarian trap and commits to the unipolarization of the political landscape, it will slide, if inadvertently, further and further into authoritarian territory. Eventually, as more symptoms reveal themselves, the EU will increase the heat on the EU candidate, criticizing its government for its increasingly non-democratic behaviour. With an already tarnished international reputation, the AKP may then choose simply to “go it alone” and turn its face solely to its own fifty-per cent, which, when the chips are down, is essentially what it needs to stay in power. Considering the relatively conservative worldviews of many AKP voters as well as the ever-decreasing attractiveness of the idea of becoming a member of a union that is battling with economic stagnation, “freezing” accession talks with the EU will not be a necessarily risky or costly political move for AKP, especially if it succeeds in convincing its own base that it is the EU and not the AKP who is responsible for the break-up. Note that the Gezi Park episode made it clear to AKP that - not only domestically but also internationally – it cannot have its cake (drawing upon the discourse of the fifty per cent to push forward its policies without paying attention to the other fifty per cent) and eat it too (convincing audiences outside its base that it remains true to the principles of liberal democracy). From there, it would not take a huge leap for the AKP to fuel a process that will eventually sever the accession talks between Turkey and the EU. If the AKP keeps drifting away from a pluralist understanding of democracy, whether we witness another Gezi or not becomes almost irrelevant in the context of the health of Turkish democracy. It is true that the presence of large numbers of protestors in the streets who are met with unprovoked and disproportional brutality at the hands of security forces, as was the case during Gezi, points towards the existence of serious problems with a democracy. However, the absence of hundreds of thousands of protestors in the streets does not necessarily suggest that the problems are solved. It may also mean that things are getting even worse, especially if the government is taking preventive measures (“preventive arrests” come to mind) while also initiating new policies to “deter” prospective protestors (especially through new regulations that will put the academic lives of university students who contemplate joining those protests on the line). The EU has paid little attention to these ailments of Turkish democracy despite all the signals that pointed towards their presence until the problems finally revealed themselves in Gezi. It is true that the leverage that the EU has over Turkey is limited. Yet, it still has some leverage, which will not be the case if a “break-up” over accession negotiations takes place. The EU would be better off paying closer attention - proactively - to the underlying problems within the Turkish democracy, as opposed to merely reacting to the symptoms as and when they erupt.